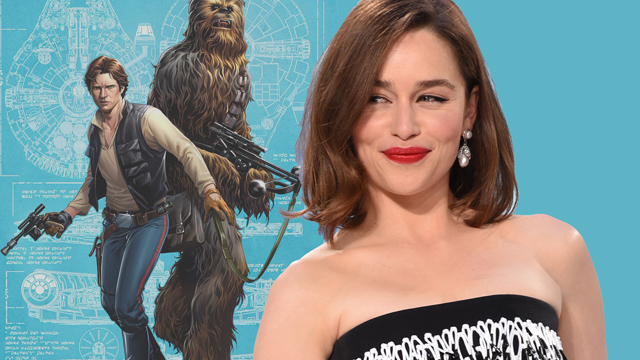 Emilia Clarke Says Her Star Wars Character Is "Awesome"
There has been a ton of news popping up recently from the Han Solo standalone film, and unfortunately it hasn't been all good due to the recent change in directors. Thankfully we now have at least one piece of encouraging news from one of the actors in the film. "All I can say is that she's awesome. Like, legit, that's all I can actually get away with saying. There's a stormtrooper with a gun, and he's going to come walking in any second." You can read the full interview over on Rolling Stone! Emilia will star alongside Alden Ehrenreich, Donald Glover, Joonas Suotamo, Woody Harrelson, and many others. The untitled Han Solo film is set for release on May 25th, 2018! I think a nice, in-character cast photo, to show off what they're going for, would be a good first-step toward quelling the growing doubt about this movie. I'm looking forward to it but I'm hoping to get genuinely excited at some point.